Gardening is fun and relaxing and you can always bring a fun feel to it by adding a birdbath. You don’t necessarily have to use an electric model, since you don’t want your electricity bill get too high. You may also give it a go with a solar birdbath that looks nice and doesn’t has a word on your monthly bills. A solar birdbath isn’t just great for your wallet, but also for the environment, since it provides clean, running water for birds with no electricity consuming. It uses solar powered panel that may be place inside the basin or outside the bath, collecting solar energy from the sun throughout the day. The collected energy powers up the pump that maintains the birdbath water in circulation. Sure, a solar birdbath needs direct sunlight and isn’t as powerful as an electric model, but keep in mind that a solar type is less noisy, bringing more peace to your garden. Keep in mind that you may always go for a hybrid model that is both electric and solar, using the electricity on a cloudy day. Another thing we really like on the solar birdbath fountains is that they don’t need any extension cords or outlets, giving you the liberty of placing them wherever you want. They are so easy to install and don’t imply any transformations, wiring nor operating costs- cheap and easy, right? When shopping for a solar birdbath, it’s important to also take a peek at the solar panels, as they are essential to the efficiency of the birdbath. The bigger the solar panels, the more power on the birdbath. You’d want them to be weather resistant and to deliver even on a cloudy day. The style is quite important on a solar birdbath fountain and you want it to fit your garden, to improve its appearance. 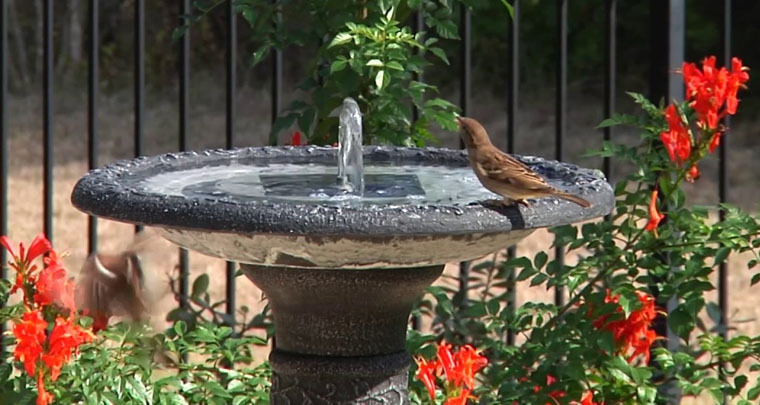 Once you installed the birdbath fountain, you don’t need to carefully watch it for maintenance. Keep in mind to remove it once the cold weather has come since cold water may damage it. You can also step up your game a bit and also use a birdbath heater that keeps the water and the whole birdbath fountain running and warm. 1). 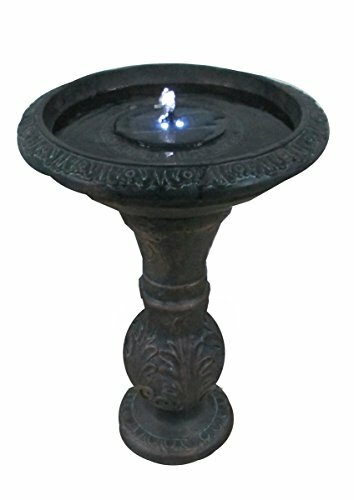 The black finish and simple, yet elegant design of the Round Bronze Solar Fountain Solar Birdbath are the main strengths of the birdbath fountain, able to bring an elegant vibe to any garden. The birdbath fountain presents one tier round bronze solar fountain and this would be the first minor issues. Even though it looks so nice, the tier is more block and not bronze. 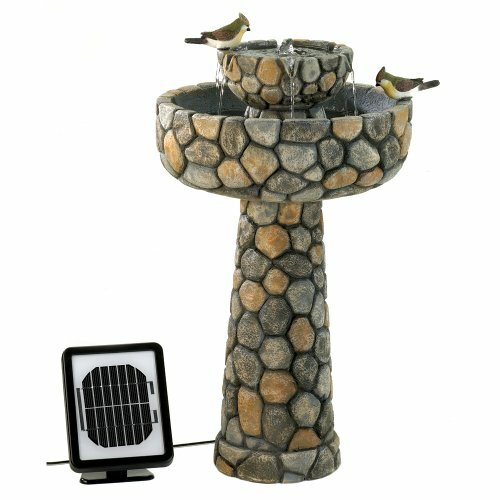 The solar panel is reliable and efficient, providing 1.2-Watt power per hour and the birdbath also comes with a good Li battery. The solar powered pump ensures a pretty steady stream, creating a nice atmosphere with all the sounds and looks of the flowing water. The built-in LED lights complete its appearance and make it look so nice during the night. The birdbath fountain is made with resin so it holds up pretty well in time. You don’t need to take special care of the birdbath fountain. Made of long lasting resin, the fountain is maintenance free. You may need though to check every now and then and seek that it doesn’t clog. Despite the minor issues, the birdbath fountain is a good choice, especially considering its low price. 2). 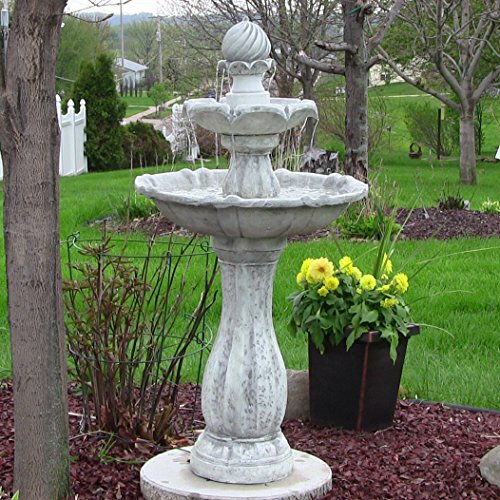 Lightweight and easy to move around, the Best Choice Products Solar Power 2 Tier Weathered Stone Birdbath Fountain Gray is an option to consider when you want to bring a good vibe to your garden. The birdbath fountain is made of poly-resin material, presenting a nice, textured, and weather finish. Even though it looks like stone, the material is poly-resin, taking a good beat. You may choose one of the 4 spout types for water to come out. The water falls down through 4 indentations to the bottom basin. Water is also very subtly recycled and filtered by a concealed water pump afterwards. The birdbath fountain doesn’t clog, but it’s better to wipe off the pump intake from time to time since the pump has no filter. The fountain is easy to install and to use and when it’s on, the battery-powered solar panel is in function, charging when exposed to sunlight. When the fountain is off, the battery is charging. Once the battery is fully charged, the fountain may work for straight 6 hours. As for the capacity, the birdbath fountain has a 2.5-gallon water capacity, which is quite enough for a garden. The 2-level design of the fountain is very appealing for birds and you may complete its looks by surrounding it with rocks. The four LED lights are bright and white, increasing the soothing effect of the fountain. 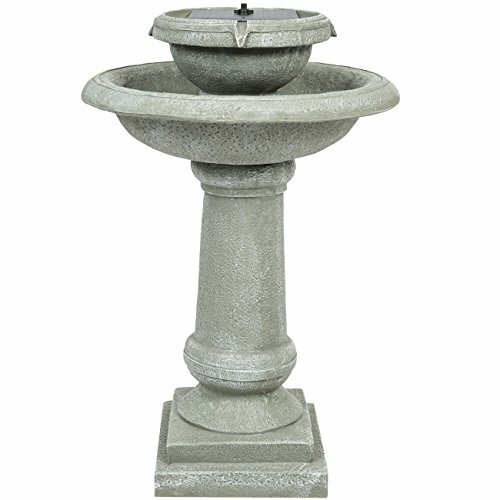 Easy to maintain, with an efficient pump, the birdbath fountain is easy to put together and to move around. Nevertheless, for the nice appearance and easy installation, the birdbath fountain still stands as a dependable solar option for any garden. 3). When you get the Wishing Well Solar Fountain, one thing is sure: it looks to cute and real so birds and cats (oops) would also want to have a better look at! The wishing well solar fountain is a birdbath and a fountain at the same time, so you get two items for the price of one. The fountain is made with an imitation fieldstone that doesn’t just look impressive, but also handles pretty well the weather challenges. The birdbath/wishing well fountain is made with polyresin, stone powder and sand, taking a good beating. The solar panel is reliable and the fountain actually comes with a pump and an electrical adapter. Therefore, on a cloudy day you may also use the electrical adapter. The design is well thought out and the fountain fits two-tiers of bowls for the water, ensuring an efficient circulation and falling into. One thing it’s really cute about the design: the two birds that, even if aren’t true to size, still have a nice effect. The fountain comes in three pieces so you do need to put it together. Most think it’s easy to assemble it, but this has to do a lot with your skills. We like a lot the good water return, the nice bubbling sound and the cute appearance. Keep in mind to secure the base, as you don’t want it to fall down on a windy day. Despite the minor flaws, we still like the fountain for its versatility, nice sound and cute looks. 4). If you’re looking for a modern feel in your garden, put your faith and trust in the Modern Cascading Bowls Solar-on-Demand Water Fountain. The birdbath fountain comes with a solar panel and 16ft. long cable. The pump presents protection technology, which means the pump actually shuts off when the water level is too low. The construction of the fountain is good, made with long lasting resin and fiberglass, taking the difficult weather conditions. Don’t worry about the stability of the fountain that doesn’t fall down on a windy day. The fountain charges throughout the day thanks to the solar panel that isn’t too sensitive to sunlight. It charges up even on a cloudy day. Anyways, the fountain comes with a solar-on-demand technology, which means it runs in/out of the sun by switching the on/off button. We really like the good water flow of the fountain and its calming sounds. We also like its easy installation and you don’t need some special skills to put it together. We shouldn’t forget to mention the LED lights that are placed in top bowl. The LED lights increase the soothing effect of the fountain. As for the bowl, it holds enough water. 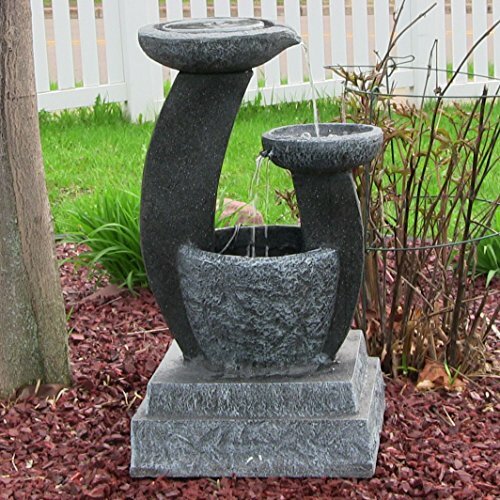 Lightweight, easy to move around, the birdbath fountain is a nice addition to any garden. Regardless these issues, you can definitely put your money at stake with this model of birdbath fountain. 5). Don’t be afraid to install an impressive solar birdbath in your garden and spend the extra buck for the Sunnydaze 2-Tier Arcade Solar on Demand Fountain with LED Light. The solar fountain is made with long lasting resin and fiberglass so it’s quite lightweight and very easy to move around. The solar panel may be small, but it’s easy to mount on most surfaces and quite efficient. You don’t get just the solar panel, but a rechargeable battery pack also and a compatible submersible water pump. The power cord connecting them is 16ft. long, which allows you to install the solar panel in a convenient location. The battery life is good and the solar charge may last all evening. As it charges during the day (pretty fast we may add), the fountain may run on a cloudy day or during the night as well. The LED lights on the fountain are a nice addition, improving its soothing effects. The calming sound and nice water flow from the top down the two tiers create a nice, relaxing atmosphere in your garden. Its swirling ridge top is impressive and artistic, adding an interesting contemporary vibe to any garden. It’s not difficult to put together the birdbath fountain and the fountain works well. Well-made and calming, the birdbath fountain doesn’t disappoint. For the artistic looks and soothing effects, the birdbath fountain is one solar option not to miss out when shopping.